Kai shares her Drizzly Day Delights! It’s been raining cats and dogs these past few days, so I asked my dad if we could maybe bake some cookies! I figure that it would be a good idea since Koa and Leo (my 2 little brothers are always getting into trouble). 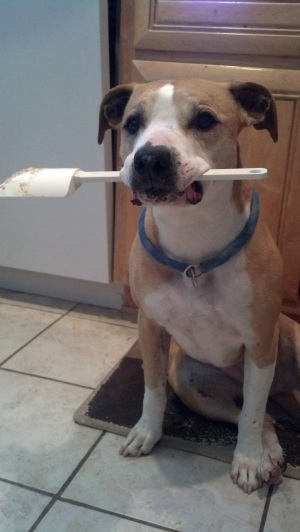 Besides, I LOVE helping my dad in the kitchen. He says that I’m a beater licking specialist. Mmmm…. So after we all looked through a few recipe books, we decided on this awesome, paw-some drop cookie (which i figured all cookies that land on the ground are “drop” cookies!) w/bananas! One of my favorites! We picked this one from Cooking the Three Dog Bakery Way. It’s super easy and incredibly tasty! 3. 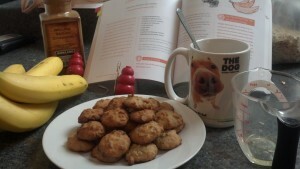 Stir together the flour, baking paw-der, cinnamon and oats in a bowl and set aside. 4. In a large mixing bowl, mix the oil, honey, egg, bananas and vanilla. Make sure it’s mixed really well! 5. Slowly stir in the dry ingredients to the wet until combined. 7. Bake about 15 minutes or until brown. Results: OMG! Me and my brothers LOOOOVE this cookie! They are so good just out of the oven, but make sure you wait for them to cool a bit before giving them to your fur-kids. I just can’t get enough of these darn cookies, but dad says that it’s important that I share w/my little brothers (oh and dad seems to like them too. He said it’s the perfect sweet treat for humans without all of the bad stuff to make him fat-ter!) Being a pitbull responsible for two 10 lb dogs is a lot of responsiblity, but I do love these bossy little guys! It’s a good thing that they’re cute. I hope that you get a chance to bake these with your pack too. Let me know what you think!